These stories are familiar to everyone and are unfortunately true, to a large extent. 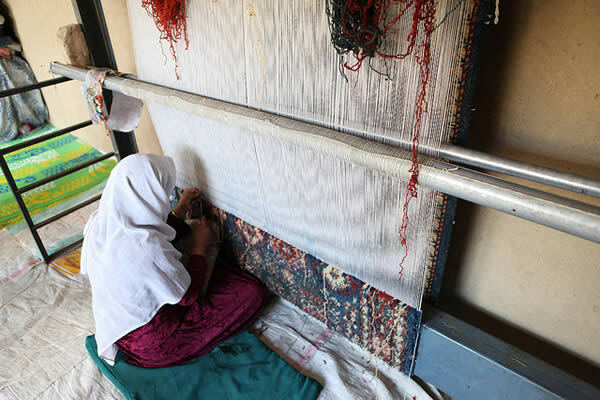 The majority of women in Afghanistan do suffer from harsh cultural and traditional rules that are made even worse by the constant misinterpretation of religious law. On a regular basis, women are harassed by male family members and subjected to sexual and gender-based violence. But every woman is not a passive victim. There are heroic women who resist, fight back, and stand up to defend themselves and their children. Sabera is one such heroine. Sabera has five children and lives happily in Mazar-e-Sharif. She is a lively woman who faces her life’s miseries with a lovely smile and patience. Her green eyes shine with hope, although it is through tears much of the time. It was 1998 and Sabera was in her early twenties when she married a man named Ali. He was short and skinny and he had sight impairment, and on their wedding day people were surprised and curious at the same time because nobody else would marry him. But after some time had passed, the truth was revealed that she had been previously widowed. Her new sister-in-law, Nadia, who didn’t like her from the first day, and treated her like the servant of the family, brought the facts to light. About six years before her marriage to Ali, when Sabera was a teenager, she was kidnapped by Mujahideen armed forces in her village. She was raped and forced to live with the militia commander for a few years. When the commander died, she was forced to marry another armed man from the group. By this time her family had abandoned her and declared her to be dead. Finally, her husband was also killed, and she was widowed. Sabera’s tragic life doesn’t fit onto one or two blank sheets of paper. But I admire her ambition to continue life despite so many traumas. She is a wise woman. Although marrying a disabled man didn’t change her life for the better, and may even have doubled her problems, she is happy. She is a breadwinner. She works knitting carpets and cleaning and at the same time is a busy mother with five children. Knowing that life has not been fair, she hasn’t given up. She smiles and says that she feels lucky because God has blessed her with children and she works hard to educate them. Sabera is a story of resistance. There are many other brave, hardworking, and positive women in male-dominated Afghan society. Her story can be a lesson in heroism to women everywhere. No matter what life throws at you, if you have a will you can overcome challenges and find happiness. “Her green eyes shine with hope, although it is through tears much of the time.” This was such a powerful line when I read it. It brings my own eyes to tears knowing what we as women endure–and then to still feel blessed by God! May the women of Afghan continue to fight their subversive fight. Smile, Sabera! Thank you for writing this story, I agree with you about discrimination and violence against women in Afghanistan. What we must do as a woman is not sit silent and that is what you are doing. I love your writing not only because it is beautifully written, but because it is a story of a woman telling by another woman. It means a lot in a sick, blind Afghan society. All of you women who are writing for this blog are brave, hardworking, and positive, like Sabera. Even by writing your essays, you are joining hands with her.